While there are many views across the political spectrum, there are some things on which we can all come together. 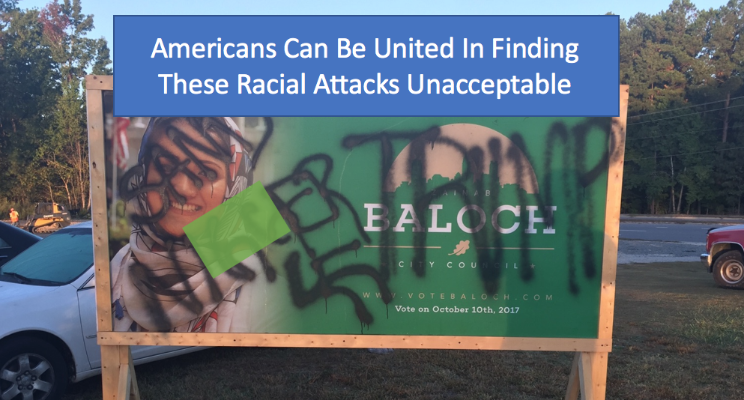 The racial attacks on Zainab Baloch, a candidate for Raleigh city council, are unacceptable. The people I know, across the political spectrum, condemn this act of bigotry. We started our country with “We hold these truths to be self evident, that all men are created equal, …” While the United States has not always lived up to this ideal, it is the goal we strive for. Attacking people because of their race or religion is the opposite of this fundamental value. It is un-American, and every effort should be made to see that it is stopped.